Many people search their entire lives for the perfect business opportunity. 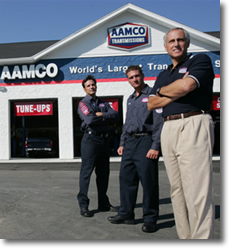 If you think an AAMCO franchise might be right for you, AAMCO invites you to come to our home office in suburban Philadelphia. You will have the opportunity to see and meet AAMCO executives and support personnel, and ask any questions you may have. We'll share the proven AAMCO Business System, including AAMCO-specific Marketing, Sales, Production, and Customer Satisfaction procedures. We'll show you the inside workings of AAMCO, including Market Development, Real Estate, AAMCO University, Operations, Marketing, Technical Support and Training, Fleet, and Customer Relations departments. You'll learn AAMCO's current strategy and plans for the future. "I've profited greatly from this business; the support structure is very powerful at AAMCO." An AAMCO franchise offers what few other business opportunities can... A future of financial security, independence, and control. 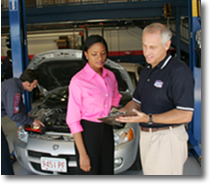 AAMCO has long been the leader in transmission repair. Now that we're offering complete car care services, AAMCO centers are providing more services, gaining more customers, and increasing their opportunities for more revenues and profits. By offering one-stop shopping for complete car care, AAMCO centers now are taking their share of the much larger market for comprehensive do-it-for-me services. Please note this opportunity is offered in the U.S. and Canada only. Interested parties should have at least $50,000 liquid capital to invest. 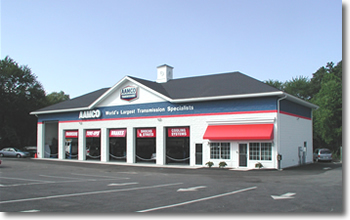 Click on Request Information for FREE info on how to open a AAMCO Transmissions franchise today! Please Note: This AAMCO Transmissions, Inc. franchise opportunity and other franchise business opportunities, businesses and franchises for sale on this web site are not to be considered as an "offering", "franchise offering", suggestion or recommendation by Franchise Leader™. This advertisement depends entirely on the truthfulness of the information provided by our advertisers which includes, but is not limited to, franchisers, franchise brokers, franchise consultants and business brokers. Franchise Leader™ recommends that you consult a lawyer, financial consultant, accountant or professional advisor before buying a franchise or business opportunity or any type of business. By using this form or any part of our website, you have agreed to all terms and conditions of Franchise Leader™. Please review our Terms & Conditions for more information.